If you are looking for a great deal on a Stairlift you have come to the right place!! We have the best price deals around. You will not get a better price on a stair lift ANYWHERE! 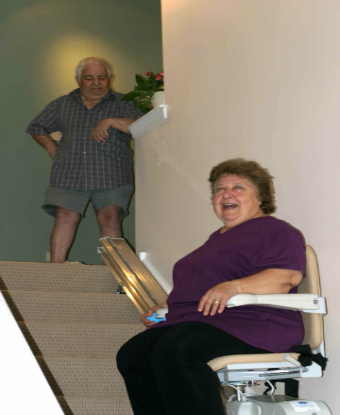 We have the best stair lift prices available in the greater Chicago area. You or someone you know is probably being challenged by barriers inside and outside the home with limited mobility. We know how frustrating this can be. Which is why we make shopping for a stair lift or ramp as smooth a process as possible. We offer rentals, certified pre-owned, and new stair lifts in many different makes and models. We also offer many different types of ramps for rental or sale. We are second to none when it comes to our customer service and with our quality products combined we can proudly say that we are the number one stairlift dealer in the Chicago area. We understand that you may have lots of questions. We are here to answer those and help navigate you to something that will allow greater accessibility to you or someone you love. Often times we even get the question “Will Medicare, Medicaid, or other types of insurance help pay for this?” Our answer: We will gladly work with any company or insurance that will be willing to help pay for the services we offer. Please take a moment to Contact us so we can discuss your needs. "Chicago Stair Lift Deals did an outstanding job on all aspects of the purchase and installation of a chair lift at our home in Oak Park. The man who measured and the two who installed were competent, caring professionals. The installation was done promptly after we placed the order and included thorough training on the chair's operation. Thanks so much."